I somewhat lovingly refer to my house as The Disaster In the Woods, or The Disaster for short. 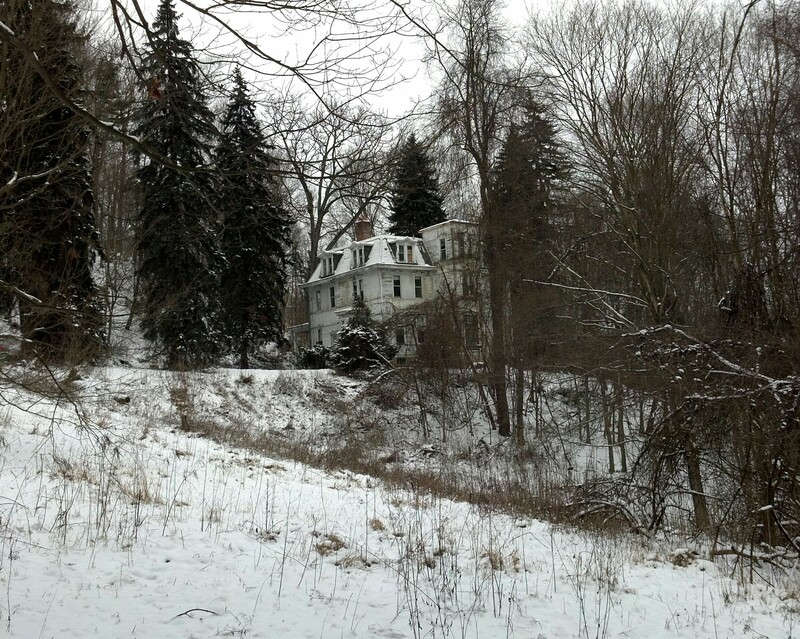 The Disaster was my husband’s dream, a collapsing stick Victorian on four acres located a few minutes outside of the city. I was a bit less excited upon seeing the house. 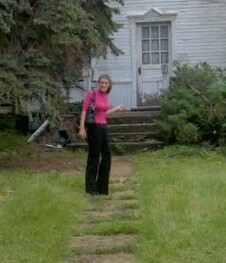 This is a picture of me at one of the side entrances the first time that I visited the house. I couldn’t believe that my husband was serious about buying this place. I hadn’t even gone inside yet, but, holy smokes, what a mess on the outside. The inside turned out to be even worse. I like fixer uppers. My last two houses were fixer uppers, but this house was something altogether different. I realized that The Disaster certainly had potential, but after years of abandonment and neglect, the house looked like a set from a horror movie. Although I had experience renovating old houses, I simply wasn’t prepared to handle a project like this. Vandals had broken into the house and dumped garbage and cleaning products all over the first floor. Burglars stole all of the copper piping, the wood mantles, the brass chandeliers, anything of value they could pull out quickly. They even tried to take one of the gigantic radiators, got it outside, realized they couldn’t carry it, and threw it down the hill. Classy, right? The house had no plumbing, the knob and tube electrical wiring flickered and only worked in some rooms, the plaster walls were collapsing, and there was no heat. The house was big, dark, and very scary. But the house had a tower and I have always wanted a house with a tower. I was three month’s pregnant when we bought The Disaster and completely bitter with regret that we sold our renovated Craftsman in a highly desirable neighborhood. There was no safe way to live in The Disaster during the early renovations, so we stayed with my in-laws. All I wanted to do was start nesting, but all I could do was sit and wait on the third floor of my in-law’s house while my husband worked on The Disaster. Now, eighteen months later, we are still hard a work. We live here now, but it is not even close to being finished. We tried to save as much as possible, we have rebuilt and recreated things to match the original product, and anything new that we bought, we tried to make sure that it was as close to original as we could find. Replicas are expensive and trying to find original pieces is both time consuming and even more expensive. If you can find old fixtures in bad shape, you can get them cheap, but you have to restore them yourself, which takes a lot of time, or chemicals, or handiwork. We are forever scouring Craigslist, eBay, Construction Junction, and Ruby Lane for old goodies. I go to House of Antique Hardware for new goodies. There has been a lot of trial and error and so many mistakes, but we have also had some big successes. The Disaster is slowly coming along. Much more slowly than I anticipated. I am an impatient person and an organizational neat freak, so this house is driving me insane. Sometimes I feel like I’m living in a movie, the Money Pit House meets the Burnt Offerings House. Dealing with tools, fixtures, wood, mess everywhere. Ugh. Trying to keep the baby and the dogs out of the danger zones. Ugh. I keep telling myself to stay positive because eventually, I will finally get my chance to furnish and decorate. Hooray! I cannot wait for that day to come. 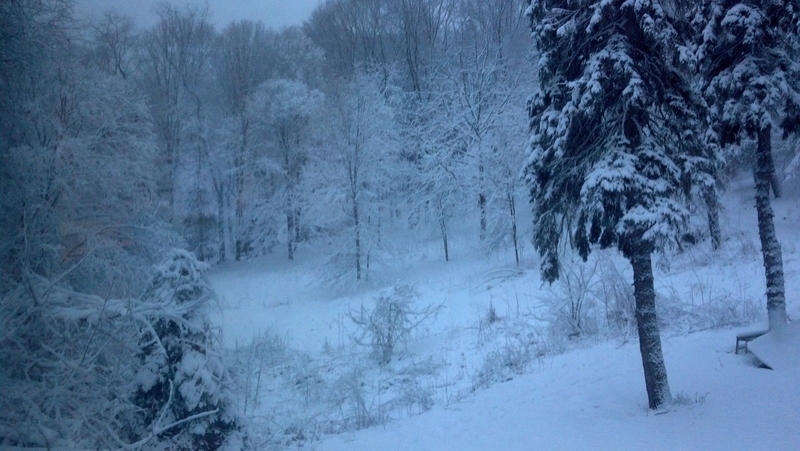 As frustrated as I feel with The Disaster, this is the winter view from my bedroom window and I only have a five minute drive into the city. So it’s not all bad. I just have to keep my sanity until we get the interior complete…and then we will begin work on the exterior. This entry was posted in Home and tagged Construction Junction, Craigslist, Ebay, Home Renovations, Home Restoration, House of Antique Hardware, Ruby Lane, Stick Victorian, The Money Pit, Victorian Renovations by Candid Mama. Bookmark the permalink. I can’t even imagine how much work this would be, but damn is it beautiful. Thank you so much. It has been extremely difficult trying to remain sane during all of this. The house is slowly coming along and with it, a sense of accomplishment. There are still many days where I want to run screaming for the hills though.